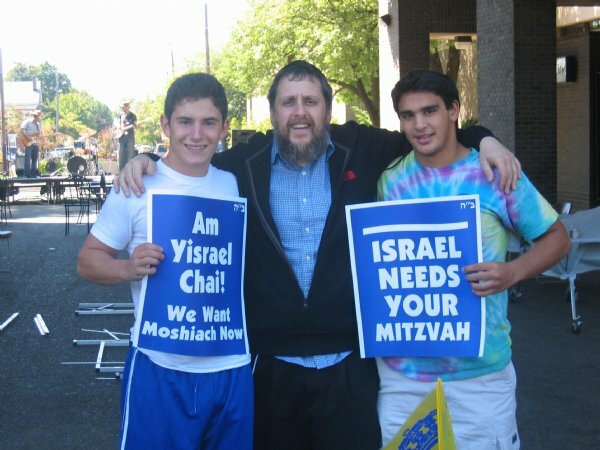 Rabbi Baruch Goodman and student volunteers at the Mitzvah Booth, visited by hundreds at Chabad's Israel-Fest. More than one thousand students participated in a day-long fair celebrating the Jewish New Year and their connection to the the Jewish homeland - Israel. 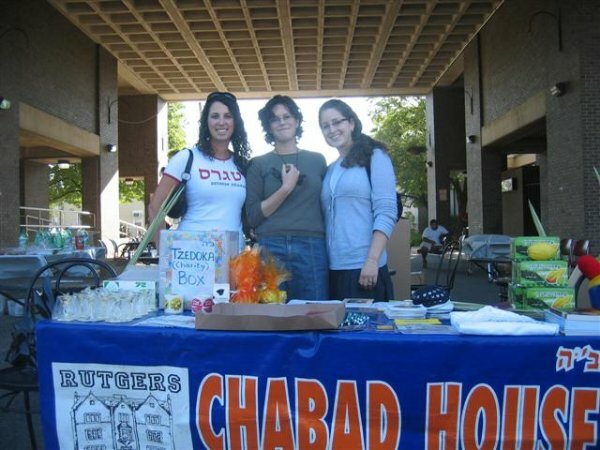 Sponsored by the Rutgers Chabad House and by twenty related student organizations and vendors, the fair featured a panoply of activities that enabled the university students to discover more about Israel. It also featured a live "Kotel Hamaaravi", Western Wall display that many students were able to perform a Mitzvah and write and insert their personal New Year requests. The Mitzvah notes have since been sent to be inserted in the Kotel, in Jerusalem. Over one hundred students donned Tefillin at this 'Wall'many for the first time in their lives, with Chabad Rabbi Shraga Crombie. The Israel-Fest was held on Tuesday, Sept. 18th, during the first weeks of the school year. Rabbi Baruch Goodman, Chabad's director of campus activities, explained, "We do this at the beginning of the year, to enable students. especially first-year students, to realize that their link to Judaism and Israel, is strong and must be continually developed during their campus years." He added, "Many thousands of young men and women, have benefited from Chabad's activities by actually increasing their Jewish awareness via such programs." Student volunteers distributing apples and honey at New Year Israel-Fest at Rutgers. The festival featured Israel's pop-band Hamakor, and the Hasidic-rap band "Kosha-Dillz", and over six hundred students danced and sang with the bands during their six hour concert. The vendor booths also featured free Israeli Falafel and Hummus, Israeli jewelry, Jewish CD's, and a special booth offering free trips to Israel for interested students. Rabbi Yosef Carlebach, director of Chabad House and Chabad activities in central and southern New Jersey, stated, "The Jewish New Year is the time that we beseech G-d to look favorably upon His people and man-kind in general. The activities of our students and all our people at this time will surely bring the Divine blessings to our world this year 5768, and hasten the complete redemption with the coming of Moshiach, speedily in our days." Rabbi Baruch Goodman and students performing Mitzvot in front of the "Kotel Hamaaravi" in front of Rutgers Student Center. The "Moshiach Booth" attracted students all day, with Chabad rabbis and staff answering many inquiries from passers-by eager to learn more about this subject. Rabbi Shraga Crombie and Rutgers student donning Tefillin at the "Rutgers Western Wall".